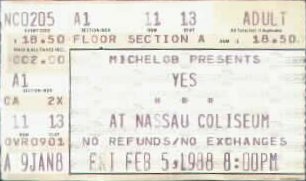 My first Yesshows were during the 90125 tour at which I had great times, but being that by 1988 I was now a Yesfreak of 4 or 5 years, through listening to boots and old stuff I had begun to notice the difference of the 80's Yes and what Steve Howe actually meant to the band - no disrespect to Trevor (that would come during the Talk tour haha) he was good, but I was really yearning to see the "classic Yes" one day. Jon apparently agreed as in what seemed to be like the next day I saw ABWH in the same venue. Highlights - Heart of the Sunrise - Guy before the show wearing the coolest denim painted Yes jacked I had ever seen - coliseum was packed up...Shoot High AIm Low - nice performance. Lowlights - Wurm without the rest of Starship, stupid really, no Whitefish (hey I was new to it) light show not being as good as the previous tour, not enough classic tunes, not doing the best material off BG like Final Eyes and I'm Running - opening with aLmost Like love- no "leave it." ..truncated version of Roundabout. Funny - Jon wearing that ridiculous poncho with half moons and stars on it during Holy Lamb. 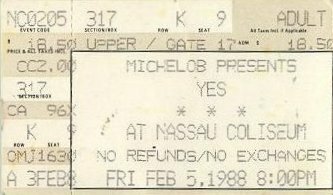 Weird thing is that this would be the last time I would see the "eighties " version of Yes until 6 years later - in '94!!! During "And You And I" there was this blonde woman in one of the front rows doing that noodley Grateful Dead inspired-type dancing, waving her arms in the air all pseudo-majestically. Also, if memory serves, during "Holy Lamb" a big globe-type thing inflated onstage. "Wurm" without the rest of "Starship Trooper"??? Hmmm.... I wonder if Skynyrd ever closed a concert by playing only the last 3-chord vamp section of "Freebird." 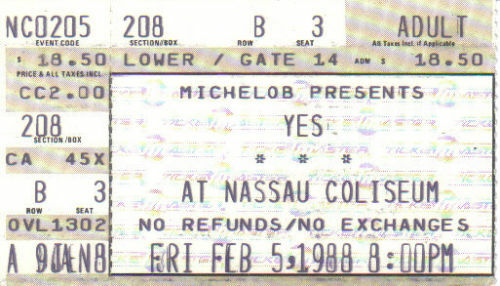 Seriously, it was a well-performed show and the set list was rather successful at encompassing the bands entire career. As for the gent in the previous review who thought the red sweeping lights during "Shoot High, Aim Low" resembled a WWI battlefield: while I certainly can't criticize his interpration, I cannot say my response was remotely similar to his. When I saw that particular lighting effect I thought: "Good lord, this looks like a bloody Duran Duran video!!!!! Before the show, in the lower level, there was a supermarket convention. My friend and I loaded up on free samples of chips and pretzels. The woman who showed us to our seat was, like me, somewhat horizontally challenged, so she came by to our section a couple times to see how we were and to sample some Ruffles. I remember that during "Shoot High, Aim Low" there were these red lights that swept outward across the audience from the stage. It made me think of a WWI open battlefield, with a very angry red light searching out for signs of life. I hope none of us ever have to see combat in our lifetimes, and I don't think that's what Yes had in mind when they did that effect, but that's what came to my mind.